OK, this these are pretty geeky items — but still pretty cool. Basically, it’s for wines that need to breathe — think young, expensive Zins, Cabs, and mature Bordeaux and Burgundy. 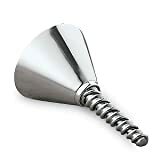 After placing the funnel thing into the top of your decanter, you pour the wine through it and it does two things: first, a screen traps the sediment, and second, its slanted spout further aerates the wine by directing it against the inside wall of the decanter. For those who are so concerned about “bruising” their wine, this is a gentler introduction to the bottom of the decanter. It also comes with a nifty, shiny stand to display the funnel prominently on the wine bar. Want to go one better? Spend $55 for the Spiral Pewter Funnel. Remember as a kid you drank juice through one of those spiral straws? Well this is just the opposite — though that gives me an idea to freak out a wine snob at the next party. As you might guess, the wine takes a whirlwind of a tour before falling into the decanter, and the purpose of all this round-and-round motion is to further aerate the wine. The “French” funnel is similar, except that it has little pinholes to direct the wine toward the the decanter sides. And it’s French, which means it carries a bit more wine snobbery cachet. Any of these is a must for wine ubergeeks.